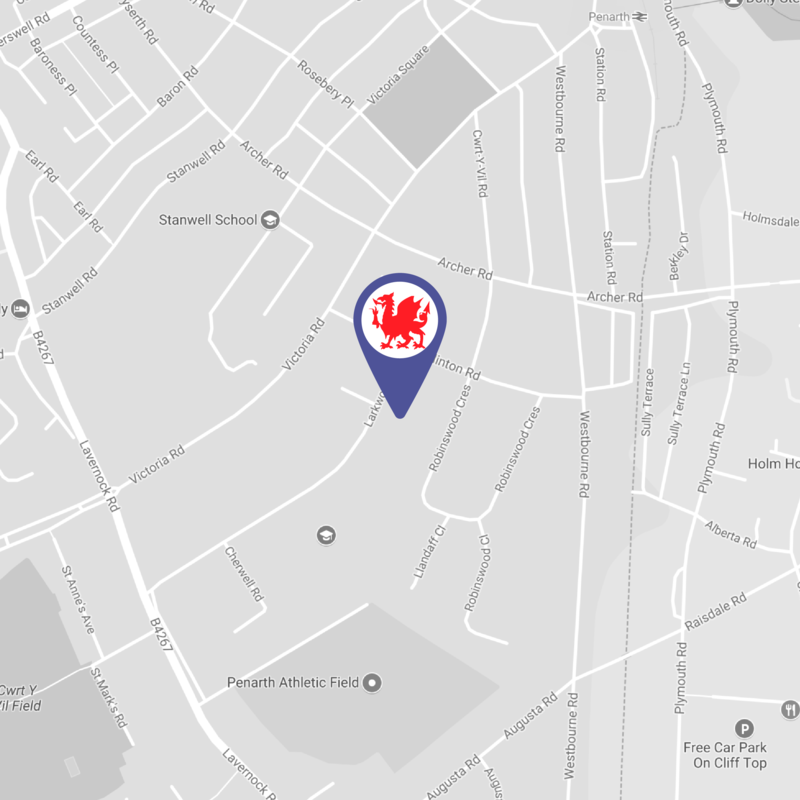 Our Club is located approximately 12 minutes walk from Penarth train station. Penarth itself is a short distance from the Capital of Wales, Cardiff, and is easily accessed via car or public transport. On-street Parking is available on the roads surrounding the Club (Evenlode Avenue or Clinton Road are the closest). We ask visitors to be mindful of our neighbours when parking their vehicles. Our postcode is CF64 3JJ. For further directions and local transport options, please read on. Follow the A4232 heading south towards Cardiff for approximately 6 miles. Take the exit signposted Barry (A4055) and Penarth (A4160). At the roundabout take the 3rd exit for Barry. Continue straight-ahead, through the lights with the Morrisons supermarket on your left. Keep in the right-hand lane until you reach the lights at the top of the hill. Continue straight-ahead following the A4055 towards Barry. At the next set of traffic lights (adjacent to the Merrie Harrier Pub) turn left following signs for Sully (B4267). Continue on the B4267 for 1 mile. After you pass through a set of traffic lights (adjacent to the Cefn Mably), take the 2nd left onto Evenlode Avenue. The tennis club is located on your right after approximately 400m. Penarth railway station is located approximately 12 minutes walk from the tennis club. A regular train service runs from Cardiff Central Station, with 2-4 trains per hour depending on the time of day. Trains depart from Platform 8 of Cardiff Central Station and take 10 minutes. Exit the station and continue ahead onto Victoria Road. Turn left onto Victoria road and walk for 600m. After you pass the zebra crossing, take the next left onto Clinton Road. Continue for 30m and turn right onto Larkwood Avenue. The club is located on your left shortly after you arrive on Larkwood Avenue. Alternatively, local taxi services are available below. Alternatively, Uber taxis do operate in and around the Cardiff area.